Discussion some genotype calls are wrong, why? some genotype calls are wrong, why? For some genotypes, it seems are wrong, I know it's model based, and base q, map q, etc are considered in the model. In one case, the two variants are adjacent to each other. In some case, they are one base indels. Can you give some more supporting info? 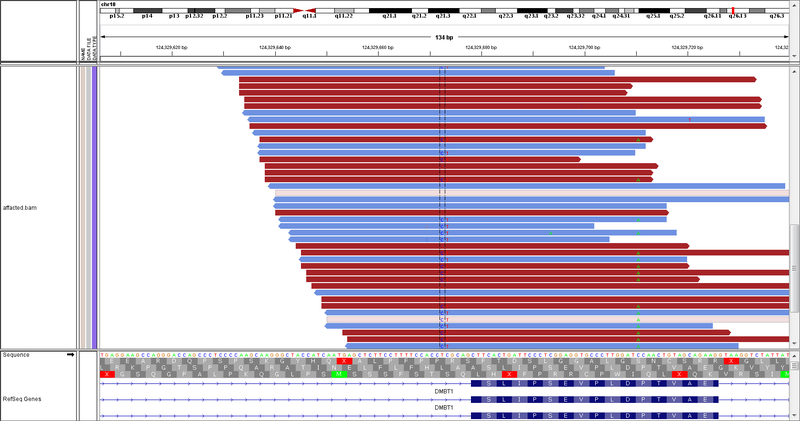 For example, some IGV or pileup screenshots that show the reads and base calls at those loci? Without seeing more it's impossible to interpret the genotype numbers. I can email you a small slice of the BAM file, since it has some meta info, I do not want to post it here. What is your command-line for calling? Are you possibly running with the generalized ploidy model and asking to genotype a ploidy of 1? I would try updating to the latest version of the code and turning off BAQ (which has been known to kill multi-nucleotide polymorphisms). If that doesn't work, it would be good to see what the HaplotypeCaller calls at this position. Thanks a lot! That's exactly the cause. Can you give me a clue about the effect on false positive calls if I turn it off? To my understanding (please correct me if I am wrong or incomplete), BAQ was introduced to reduce false positive calls around alignment induced indels. I wonder how much benefits it has. BAQ has tons of benefit for regular SNPs, but it tends to kill more complex events like MNPs (as you saw firsthand) and indels. This is precisely why we have developed the HaplotypeCaller as the successor to the UnifiedGenotyper. So HaplotypeCaller kept the benefits and eliminated the drawbacks on complex events? Is 1000genome project using HaplotypeCaller? I'd like to know more about it. Could you point me to some docs or presentations about it, or the comparison of it and UnifiedGenotyper. What is the major difference?